The Yellow-footed Antechinus (Antechinus flavipes) is a common inhabitant of drier forests and woodlands in northern Victoria, as long as there’s good habitat around. 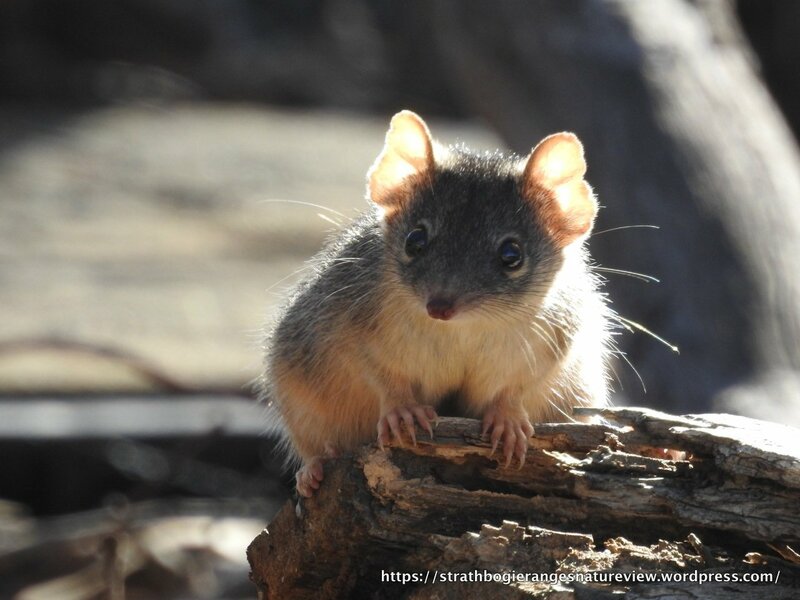 This small carnivorous marsupial eats mainly invertebrates (eg. insects, spiders) and occasionally small skinks which it finds by searching high and low, checking every crack and crevice for a meal. With those ears, it’s clear that hearing the sound of prey is probably as important as seeing. Like most other small mammals, the Yellow-footed Antechinus is manly nocturnal, but can commonly be seen out and about during the day. Like several other species of Antechinus, all the males die after a frenetic breeding season (Aug-Sep), leaving a population comprising just pregnant females, until they give birth in the following month. This little fellow was a male, clearly identified by his dangling scrotum (though not visible in these pics), just in front of the base of the tail. This little guy lives on a roadside in woodland in the Koonda Hills, north of Violet town. A great spot, with plenty of leaf litter and fallen timber, a sparse shrub-layer and a variety of different sized trees – all up, a quality piece of native real estate. Seems to like this fence-post. Leaf litter was a great source of interest. Not afraid of adopting a vulnerable position in order to get some sun. Agile climbers and rarely sitting still. Yellow-footed Antechinus don’t occur up here in the Ranges, but we do have a closely related species, the Agile Antechinus (A. agilis), which is a little smaller and a uniform dark brown in colour. Hi mccnmatt. The male die-off itself isn’t an issue from an extinction point of view, in fact is could be argued that it’s evolution has given this and similar species an edge, as they are quite successful (common over large geographic areas). Though there’s no room for complacency. Maintaining and creating suitable habitat is the key. Hi Richard, the Antechinus on Baw Baw, though very similar, are a different species; most likely the Agile Antechinus (A. agilis). They are superficially similar, though slightly smaller and lack the rusty/yellow colouration of the YFA. The pale eye-rings of the YFA are also distinctive. A second species is also present above the snowline, the Swamp Antechinus (A. swainsonii), though less likely to be seen. Fortunately for us, both Agile and Yellow-footed Antechinus are quite partial to sharing human space; often the only evidence are their small droppings on the windowsill! Great pictures Bert. I have seen these up in the snow at Baw Baw and in the lodge. Wow great photographs Bert, thanks for sharing. Brilliant pictures, way cool to see these. The ones I’ve seen live didn’t stick around for pics. Thank you for sharing these gems. What a fascinating critter — and great pics too! I wonder of the expiry of the males before the next generation comes along makes them more vulnerable to extinction? Fantastic shots Bert. I thought Antechinus were nocturnal and very shy! ?